Cultivate volunteer Becca J. Roberts reports from the Oxford Real Farming Conference, where for the second year the New Generation: New Ideas strand was hosted by Cultivate. This article was first published at Sustainable Food Trust. We live in an era where intensive production of large quantities of cheap food is the dominant ‘best practice.’ It is also a time when nature and culture are increasingly divorced from one another, with significant impact on our ideas about agricultural production and food consumption. What are the Oxford farming conferences? The Oxford Real Farming Conference was established by Colin Tudge and Graham Harvey in 2010, in direct response to the Oxford Farming Conference (OFC). Both events take place over the same days in January, and are situated just down the road from each other. Over its 60-year history, the OFC has predominantly represented corporate interests in agribusiness, food retail and government. The Oxford Real Farming Conference however focuses on agricultural sustainability, and aims to give a voice to smaller farmers, and solutions for re-localised food systems. If the ORFC aims to expand and democratise ‘alternative’ agricultural systems, the OFC promotes conventional agricultural ideas, technological fixes, and ‘business as usual’ narratives. 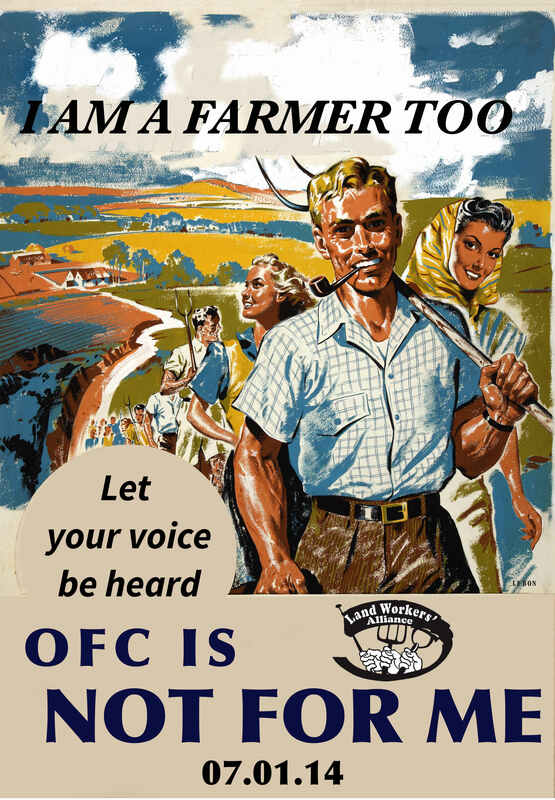 This years ORFC saw a group of delegates politely protest the Oxford Farming Conference. Early on the morning of the second day, around 70 delegates, organised by the Landworkers Alliance, rallied outside to protest the expensive ticket price, lack of access for small farmers, and to object to media coverage that promotes the OFC agenda as the only future for mainstream agriculture. Feedback at the ORFC afterwards was positive. Protesters felt that a large number of delegates had been interested and receptive to their points, and that there was an opportunity for increased dialogue between the two events. This feedback was supported by the debate that took place at the ORFC ‘True Cost Accounting‘ session organised by the Sustainable Food Trust. Several conventional farmers were present at this session, and sparked an interesting conversation about the desire of many to move towards increased sustainability. They wanted to make the point that the decision to switch farming practices was not as simple as a desire for sustainability, but involved many complex factors including financial viability, access to skills and labour, and how to manage the shift on land that had been farmed intensively for the last 30-plus years. What are the issues we face? Philip Lymbery, the Chief Executive of Compassion in World Farming, gave some particularly thought-provoking examples of the problems in his ‘Future of World Food Systems‘ talk. Highlighting the extent to which the current system wastes food, he quoted a UN report stating that one third of our food is wasted before it reaches our supermarkets or plates. This statistic however is an underestimate, not accounting for the huge amount of human-edible soybean and grain fed to livestock in CAFOs. The amount of soybean fed to cattle, for example, is equal to the equivalent land area of the EU. Reducing the number of grain-fed livestock by half, could feed an additional 1.3 billion people, whilst vastly improving the lives of cattle (who are not biologically designed to eat corn and soya in the first place.) If we then implemented measures to prevent waste within the processing system, we could reduced food waste by a further half, feeding another 1.35 billion. That’s an extra 2.65 billion people that could be fed by bringing grass and cattle back together again. Sounds simple, doesn’t it? Other talks adopted a ‘closer to home’ approach. Tuesday’s session on the ‘Future of Family Farming‘ highlighted the social challenges facing agriculture. The average age of farmers in the US is 65, and has been 59 in the UK for the last ten years. We need younger generations entering farming, not only to lessen labour demands but to help invigorate the sector and add fresh ideas. Becca Watkins, a young student at Oxford University who lives on a family farm, reflected on a comment made by another speaker: “upland farmers just seek to survive”. However, to her and other young farmers, simply surviving is not enough. Entering farming needs greater incentives, especially when compared to urban lifestyles pursued by most young people. As she comically summed up: “Old MacDonald had a farm, but I’m sure Ronald’s burger van is doing pretty well”. The scale of the problem was well summarised by Professor Tim Lang, who commented that we all want good health, good food and a good environment, but still ‘buy into’ a system that does not supply this. As one ironic commentator said: “to re-localise the food supply would be like replacing cars with skateboards and telling everyone to use the highway”. A point which brings us back to the disconnect between the two farming conferences. If re-localised, mixed use, medium-sized agricultural solutions are needed to feed society sustainably into the future, then we have to work towards changing the mainstream food supply, and not focus only on building small scale alternatives. We need to take all farmers on the journey. So, how can we lessen this value-action gap between wanting a sustainable future and actually achieving one? When it came to discussing alternative pathways and potential solutions, the limelight at the ORFC was not given to the experienced academics, policy makers and independent think-tanks. Detailing the actions taken to tackle the above challenges was left to the rest of us: locals thinking up organic food co-operatives and seed exchanges; farmers learning new and exciting agricultural practices; and entrepreneurs setting up ‘match-making’ sites for collaboration between young and old farmers. Despite their diversity, each of these talks confirmed a need for redefinition and revaluation of agriculture and food. Focusing on the need to broaden the definition of ‘best agricultural practice’, The Freedom Farming event reflected on the huge biodiversity loss and extent of soil degradation in commercial farming. Stephen Briggs, a Cambridgeshire farmer and agroforestry specialist, said we are part of a ‘flat earth farming’ society, only thinking about the 0.1 metres above and below the soil. This neglects the value of trees in agriculture: in organic leaf litter production; carbon sequestration; soil health and structure; biodiversity and food provision. With the above challenges increasing, is the ‘flat earth farming’ viewpoint still fit for purpose? Ana Digon and co. gave an animated talk about Regenerative Agriculture; advocating holistic farming methods such as water-retaining keyline agriculture and the use of crushed bones to increase soil biofertility. The point being that agricultural practice should be part of a holistic system, in which the multiple parts should not be separated but work together. There is also a need for a common food values amongst consumers. Toni Dipple gave the inspiring example of Organic Ilford (OI! ), an organic veg-box scheme and community supported agriculture (CSA) project. The land being used is on a flood plain, and so has no value to the Council for building purposes. Therefore, to gain access to the land, Toni created new value. Organic Ilford was pitched to the Council as a means to attribute to health, supply accessible and nutritious food, build community spirit and opportunities for practical education about food production. Toni concluded: “the trick is to make them believe they need you more than you need them”. We also need to find ways to value the voices of those who are commonly marginalised within agricultural and food debates: the farmers themselves. In the Access to Land talk, Zoe Wangler gave the example of the Ecological Land Cooperative. The co-operative is a multi-stakeholder system, with 50% of voting rights going to the freeholder farmers, compared to 25% for the workers and investor members. This means that farmer’s values and needs are prioritized. The same is seen outside of the UK. Michel Pimbert praised the success of smallholder citizen juries in Africa as a means to democratize agricultural research, helping give a voice to female smallholder farmers in the midst of AGRA’s vision of an African Green Revolution. Overall, it is these inspiring case studies that are greatest achievement of the ORFC, as they serve to highlight just how important individual action is, and prove that small-scale community led initiatives can be financially sustainable and deliver a wealth of other socio-cultural benefits. There is a tendency in our society to rely on policy, politicians or the economy to instigate change. The ORFC advocates a ground-up approach where farmers, food-producers and citizens collaborate together to build a viable alternative. Whilst this course of action is to be encouraged in the absence of any meaningful government-led alternative, the on-going juxtaposition of the two conferences only serves to highlight the urgent need to bring all of farming together for an honest and open debate, not only about the kind of food systems that we need to produce sufficient quantities of quality food, but also about the values and responsibility of care that we want to put at the heart of our communities. Be part of the debate – let us know what you think.